Baltimore, Nov. 20, 1859.—2.05 P. M.
Train left Washington Junction at 12.50 with Gov. Wise and 400 troops. Have yard Engine fixed up and men ready to take train to Charlestown. Our other engines are too heavy to run on Winchester road. Report fully to me of their arrival and departure, and any other matters of interest. The train with Gov. 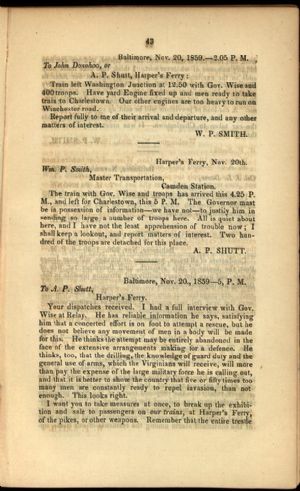 Wise and troops has arrived this 4.25 P. M., and left for Charlestown, this 5 P. M. The Governor must be in possession of information—we have not—to justify him in sending so large a number of troops here. All is quiet about here, and I have not the least apprehension of trouble now; I shall keep a lookout, and report matters of interest. Two hundred of the troops are detached for this place. Baltimore, Nov. 20., 1859—5, P. M.
Your dispatches received. I had a full interview with Gov. Wise at Relay. He has reliable information he says, satisfying him that a concerted effort is on foot to attempt a rescue, but he does not believe any movement of men in a body will be made for this. He thinks the attempt may be entirely abandoned in the face of the extensive arrangements making for a defence. He thinks, too, that the drilling, the knowledge of guard duty and the general use of arms, which the Virginians will receive, will more than pay the expense of the large military force he is calling out, and that it is better to show the country that five or fifty times too many men are constantly ready to repel invasion, than not enough. This looks right.